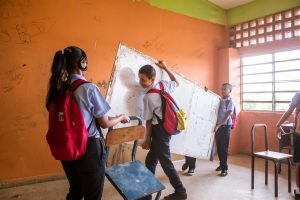 Indigenous children in Maracaibo, Venezuela, who do not attend school. Here they are waiting in line to receive food. Such children are often sent to work on the streets (or get so hungry they go of their own accord), where they are exposed to exploitation, abuse, and human trafficking. Expanding our program throughout Venezuela will allow us to help children like these. Emergency aid is vital: food, clothing, and shelter are the basics of life that every child needs. At the same time, there are long-term solutions that can change a child’s life forever. Many of the humanitarian catastrophes and emergency situations we have observed on the ground during past projects could have been avoided if the general population had a much greater awareness of and respect for Human Rights — both others’ rights, and their own. This is best taught at an early age. Furthermore, a child without education in the basic skills he needs to survive and prosper will have little chance for a bright future. Such children become prey to exploitation, trafficking, and worse. As we all know, the world of our future will be carried on the backs of today’s children. Therefore, while we at Charity United will continue to deliver emergency aid as we have in the past, we have decided to also begin to tackle some of the roots of the problems that create these humanitarian situations to begin with. We are giving children a hope for a future, as well as a better life right now. The Effective Education Program helps children of all races, creeds, and economic situations. 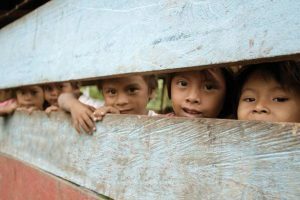 Assistance for children who are not receiving an education, due to hunger, lack of food, or general intense poverty that leads them to work on the streets — where they are often exploited, abused, and even trafficked. Basic necessities (food, clothing, etc.) for children who are too cold, hungry, or neglected to even study. The provision of missing school materials; including books, desks, chairs, and general school supplies. Effective drug education that does not create an interest in drugs but factually gets children off drugs or prevents them from beginning their use. Effective common-sense education on human rights, self respect, and personal values — so that they will dare to speak out when needed. Training in life and study skills. Teacher training that guides teachers and counselors to give the children the one-on-one individualized attention the children need, and which will give them a real chance. Anything else needed to remove barriers and to allow teachers to provide, and children to receive, a real and effective education — whether that be transport to school, shoes to travel the road, or even a bit of lunch money. The entirety of the program is geared toward the Effective Education of students. Below are but a few examples of the changes effected in children’s lives by this program. 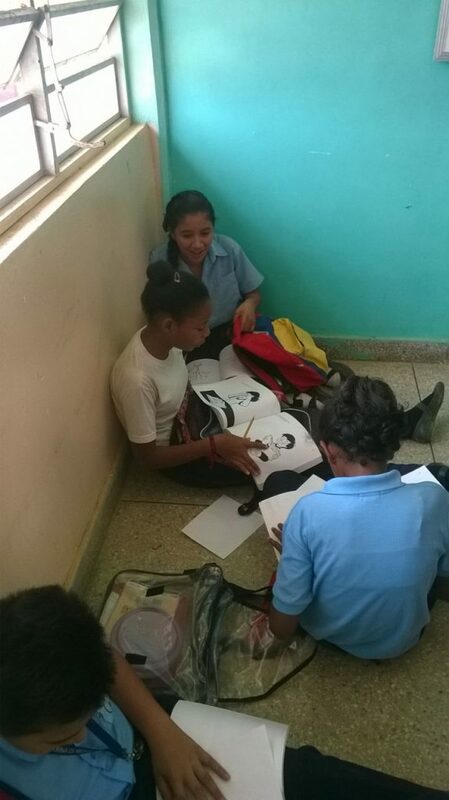 A first-year student from Libertador Tocuyito, Valencia, Carabobo told us her story. In the village where she lived (334 people) there had been 5 murders in one year. It was a terrifying place to live. 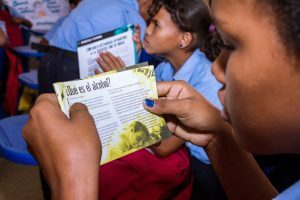 When she began to study through the Effective Education program, she realized she could help improve her dangerous community. With the guidance of her teacher, she began to go around her village, teaching others what she had learned about human rights. She spoke with more than 50 people in her village, sharing what she learned. After beginning on that path, she learned that there were no more murders. Her village began to become a safe place to live and to walk to school. “I will continue to spread these ideas to the people of my neighborhood so that it will be safer and there will be no more killing,” she told us. A high school counselor, whose job it was to deal with students who were failing or dropping out of school, had a situation with a 12-year-old girl who had been missing from school for over a month. After receiving training through the Effective Education program, and learning how to give individualized care and attention to students, she called the girl’s mother. She found her distraught, desperate, and in tears. Her daughter had run away from home and had become a child prostitute. No matter how the mother pleaded, she could not convince her or find a way to get her little girl back to her home – or school. The counselor listened fully to the mother and made sure she felt understood. Then she shared some of what she had learned in the program – about how to speak to her daughter about personal values, self-respect, and her own human rights. Armed with these new tools, the mother immediately went to the streets to find her daughter. She managed to bring her daughter back. She took her to school, where her daughter immediately began to work with the counselor and teacher, receiving individualized care and attention. She began to study concepts of human rights and personal values. The result? The girl is now back at home, living with her family, and is back in school. She is successful in her classes and has a bright future — out of the clutches of the hell of child prostitution. “This is just one of the examples of all the results I am achieving as a school councilor, thanks to the support of the Effective Education Program,” she said. What have you done to my daughter? A student’s mother arrived at a high school where the Effective Education program was in implementation. She stormed into the building in a very bewildered manner. She was so worked up, she caught the attention of both the security guards and the teachers, who escorted her to the counselor’s office. After the staff managed to calm her down, the woman explained that she had come home from work and had found her daughter an entirely different person. She no longer recognized her. “The house was clean, my daughter had done many chores, including preparing food, and she was calm and happy!” she exclaimed. The mother asked them what had changed. The daughter, herself, happily replied. She explained that she had learned about personal values and self respect at the school. She was studying and applying what she learned, and, in truth, she felt happy. The mother was still suspicious. This was very, very strange. She was sure her daughter had been given something else; a drug perhaps? Her daughter was fifteen years old and NEVER did anything to contribute at home before this. She was constantly protesting anything the mother said, and had been permanently in a bad mood. The school must be lying. They must have put her on some drug. When the counselor explained that these were the results of the educational program, the mother would not believe it. She demanded they show her the materials. And upon seeing them for herself she asked if she would be allowed to attend a class to learn them herself. The mother attended all classes, and was so surprised at the program, she asked the counselor to let her come to help to teach this knowledge to the other parents who were suffering from similar situations. Her daughter is now taking care of all the household chores so that her mother has the time to come to school to continue studying the program. “We have had a serious problem with drug dealers entering our school grounds and surrounding areas, preying on our children and students. They stooped so low as to lace sweets with drugs in order to entice the children to take them and turn them into addicts around our school of Barrera. Thanks to your Truth about Drugs workshop, and other materials provided to our teachers, we were finally able to do something about this problem. After receiving your easy-to-understand lectures, our teachers turned around and gave these lectures to more than 1,000 students. Each student was then given a “homework assignment” to teach ten others, at home or in their neighborhoods, what they had learned. Within a week, we reached about 10,000 students, parents and neighbors, by empowering our students. It started a community buzz, with everyone talking about how harmful drugs truly are. As if by miracle, suddenly the drug dealers fled the area. They are gone now, no longer harassing students and children. Our good friend Martha, one of the incredible staff of the Research Department for Quality of Life of the University of Carabobo (one of the largest universities of Venezuela) has spent decades working with schools and children – with the vision to give her nation and its children a chance for a bright future. After years of diligence, she and her colleagues have worked out a program which gets real results. The program is organized, has proven successful, and has been officially recognized by the Ministry of Science, Technology, and Innovation for implementation across the nation of Venezuela. But the recent economic crisis has made further implementation difficult. All that is lacking is the funding needed to get the program to every child in every school in the country, and as you will see below, a little goes a very long way. Some costs are already covered by government funding. Other expenses have been privately funded until the recent crisis. But the overall reach of the program has always been limited by the amount of funding available. And now, more than ever, the political and financial situation in Venezuela means that continuing this program is becoming extremely difficult. Even small items like meals and bus tickets can make the difference between a child receiving this education or never having the chance. Based on the results being achieved, we are confident that the program could have vast implications on the nation’s future if implemented broadly throughout the country. Charity United is working in collaboration with the university, to deliver this program in schools throughout the state. Once that is done, the aim is to implement it throughout Venezuela, and then throughout the rest of the world. The costs of implementing our program varies, based on school locations and needs. Yes, that means that for $1.00 you can give a child the chance for a real future. For $10.00 you can help ten children. For $100.00 … well, you get the idea. “These children show up at school, regardless of the conditions. They leave me speechless. They’re far more deserving than I ever was. Looking back now, I can see I had my education handed to me on a silver platter. In some cases, students walk hours just to arrive to a classroom where they sit on a stone floor … what can we say for certain? By working directly with students, teachers, and volunteers, we cut costs, invite participation, and get a real CHANGE. Chairs donated after students helped clean classroom put up a white board. We recognize that every individual has his own financial circumstances. Some may be able to donate large amounts, while others may only be able to donate $10.00 or $25.00. Please keep in mind that even the smallest donations have always added up and have contributed to much of progress of our past projects. For the cost of a few cups of coffee, you could literally change a dozen students’ lives. You can also help by sharing our cause with others, or by becoming a fundraiser. We hope that you will consider helping in whatever way you are able. To donate, please click the button below. 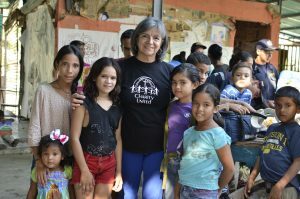 Charity United is a 501(c)(3) US Public Charity which runs programs to provide humanitarian aid to children and civilians in need – including, but not limited to, food, clothing, shelter, and education. Donations are tax deductible to the extent allowed by law. Are you eligible to participate in corporate giving programs through your company? Please visit Charity United on Benevity to view our charity profile and currently eligible projects!